A synthesis of intuitive structural concepts and sustainable building practices. 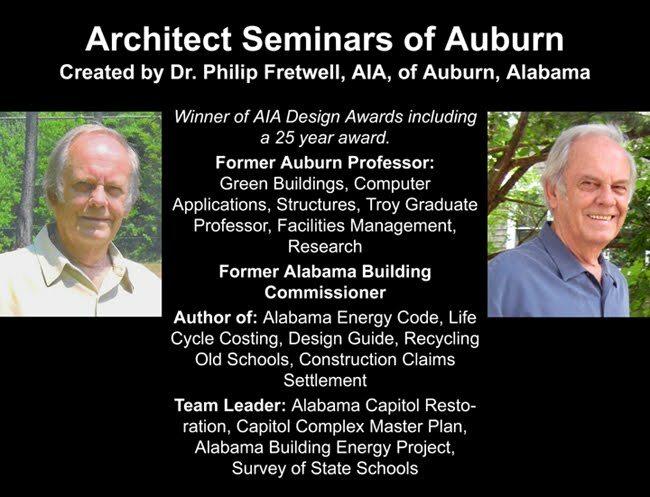 A non-mathematical seminar on the structuring components of Architecture from a designer’s point-of-view. This AIA approved course also counts for non-AIA Architects. Preview plays automatically. You can pause it. You can change the slides at your own pace. Explain how wind forces acting on a tree are similar to, and dissimilar from, wind forces on a building. Describe how the loads on a catenary differ from the loads on a parabola, and describe the catenary in relation to Gaudi’s Sagrada Familia. Discuss the action and resolution of forces on frames, arches, grids, and plates. Identify construction situations where a) membranes and b) thin shells would be best used. Your seminar will be emailed within 4 working days. Once you receive your online seminar, it is yours to keep. It is exactly like the preview slides, shown in a slideshow format - a series of discrete individualized slides of high resolution. We email the web access link and you can watch it on a laptop, iPad, Kindle, or a Nook whenever you want and wherever you are. Online seminars come in 4 parts. Write a paragraph on each part. Your paragraph would cover what slides were most informative and your reactions to selected slides. The best scheme is to open a word document and simply type in comments as you pass interesting slides in the seminar. When you finish, you will have what we require as a response to document that you have completed the seminar. Email it to us at architectseminars@gmail.com. It then becomes part of your course record and credit is approved. Our Online Seminars are 6 credit hours each. You can watch as many times as you like for references and resources. Any architect in your office can get AIA credit by paying the online fee and following reporting instructions. Any IDP in your office can get free AIA credit by pairing with an architect who has paid the registration fee. Conduct your own seminar. Designate a discussion leader. Use an office projector. Get 6 AIA credits for colleagues in your office, in one day, without leaving the premises (each must sign-up individually to receive a certificate)... An economical way to get LU credits for your entire staff. Have fun. Discuss the topics. Earn credits.